Travelers on Chicago vacations who are interested in discovering the city's rich and diversified history will not be disappointed when visiting the Chicago Museum of History, which uses film, video, books, artifacts, photographs, and art to bring the past to life. The museum's Great Chicago Stories history program is an award winner, having received the 2008 Gold MUSE Award for Teaching and Outreach, the 2008 Award for Excellence in Published Resources for Students and Teachers, and the 2008 Best of Web (Education) Award. In the eight main sections that make up the museum of Chicago history, collections containing 22 million documents, materials, and other artifacts showcase specific items relating to city history. The Chicago History Museum has an extensive archive of records from business groups, organizations, and citizens relating stories regarding their involvement in developing the city of Chicago. 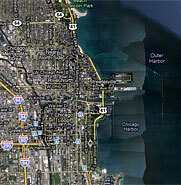 Chicago has a distinctive skyline with buildings and bridges displaying a diverse variety of architectural styles. In the Chicago Museum of History, visitors can peruse the extensive collection of materials about local architecture, such as drawings, models, photographs and manuscripts. Overall, this museum of Chicago history maintains nearly 100,000 published materials in multiple forms, including books, pamphlets, periodicals, newspaper, sheet music, maps, and atlases. Programs from sporting event, restaurant menus, entertainment announcements, and telephone directories are also part of the materials that make up a valuable research archive. A particularly interesting section of the Chicago History Museum is the area dedicated to costumes and clothing. The pieces range from clothing made for working people to exquisite gowns by Worth. Historical pieces in the collection include items worn by Abraham Lincoln, John Adams, and George Washington. The decorative and industrial arts section of the Chicago Museum of History includes pieces from the Civil War and the Revolutionary War along with items from the Great Chicago Fire and both of the world's fairs held in the city. Modern pieces of work in the collection include furniture and stained-glass items created by Frank Lloyd Wright. Film and television are part of Chicago's history as well, and the Chicago History Museum has a significant collection covering the early part of the century through today in the form of oral documentaries and recordings. The museum's painting and sculpture collection contains oil-on-canvas portraits of people of the period and the changing Chicago landscape, along with intricate sculptures using plaster, bronze, wood, and marble. Additionally, original sketches using ink, pencil, chalk, and other media are part of the extensive collection. The photos and prints collection at the Chicago Museum of Art is the largest accumulation of information in picture form about Chicago's history. The collection contains engravings, prints, photos, etchings, and lithographs relating to historical figures, the Civil War, news film, buildings, city views, and organizations. The museum of Chicago history is located at 1601 N. Clark St. and is open daily. Both public transportation and rental cars are options for getting to the museum, as parking is available for visitors at the corner of Stockton and LaSalle streets. The North & Clark Café, overlooking Lincoln Park, is conveniently open to museum patrons daily for breakfast, lunch, light snacks, and coffee.